Boston Blue Bike Angel reward strategies | Michael Hirsch, Ph.D.
Boston Blue Bikes Bike Angels rewards program started in June 2018. New York City’s Bike Angels program, run by the same Motivate Co., started in early 2017, and has top riders earning several thousand Bike Angels points per month, over 100 points daily average. These Power Angels may spend 4 hours some days riding bikes between stations. In its first full month (July 2018), Boston’s most prolific Bike Angels have earned 500-1000 rewards points. 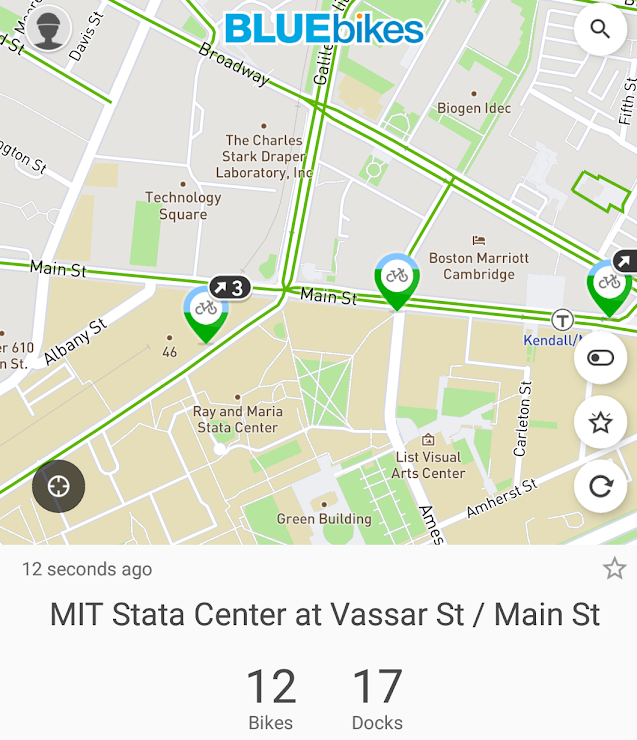 Currently, the MIT/Kendall Square area frequently has 2-3 rewards points to dock bikes. The area has such a high flow of bikes (need for more docks) that even when the MIT State Center has only 12 of 17 bikes, there was a 3 point reward for taking bikes from that station at 8am. Boston Blue Bikes comes up with interesting reward scenarios. Currently, Boston Bike Angels rewards update every 15 minutes. New York Bike Angels updated every 30 minutes. The advantage for the bikeshare provider is to have more frequently updating reward points. Once the rider removes the bike, the reward is frozen (even if the reward amount advertised to everyone has changed). stations only a few hundred meters apart may allow racking up 2 or more points per transfer. doing an extra intermediate stop, walking a couple hundred meters to the next intermediate station can be a way to get 6 or more points per ride at certain times/stations. It’s not hard to get 20-40 points / month if one rides most workdays. This can be thought of as 25% or 50% discount respectively, as the current reward structure gives one free week extension per 20 points.